In the earlier form of ships the top was a species of crows nest placed at the head of the mast to hold a look-out, or in military operations to give a place of advantage to archers and slingers. 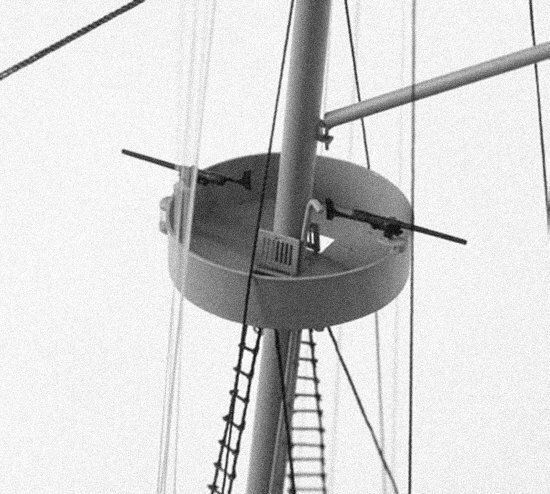 They appear occasionally as mere bags attached to one side of the mast. As a general rule they are round. In the 16th century there were frequently two tops on the fore- and mainmasts, one at the head of the lower, another at the head of the topmast, where in later times there have only been the two traverse beams which make the crosstrees. The upper top dropped out by the 17th century. The form was round, and so coptinued to be till the 18th century when the quadrangular form was introduced. The English tended to fire at least twice during closing, once at long range and again as they came along side the enemy. Once a ship had neared its foe, it was not to board until the enemy's deck was cleared by cannon fire and archery. The enemy's fighting tops were to be captured, if possible, before the soldiers of the boarding party actually stormed the enemy. The light guns would not be fired until the two fleets had come close enough to prepare for boarding. They, along with other individual missile weapons, whould be used to clear the enemy's deck. In the days of sail, the Continental Marines kept order at sea and maintained internal security on board ship. In combat they manned the fighting tops, sniping at gun crews on enemy ships. The fighting top was named this because marines would be stationed there with the purpose of sniping crew [particularly officers] of enemy ships during engagments. 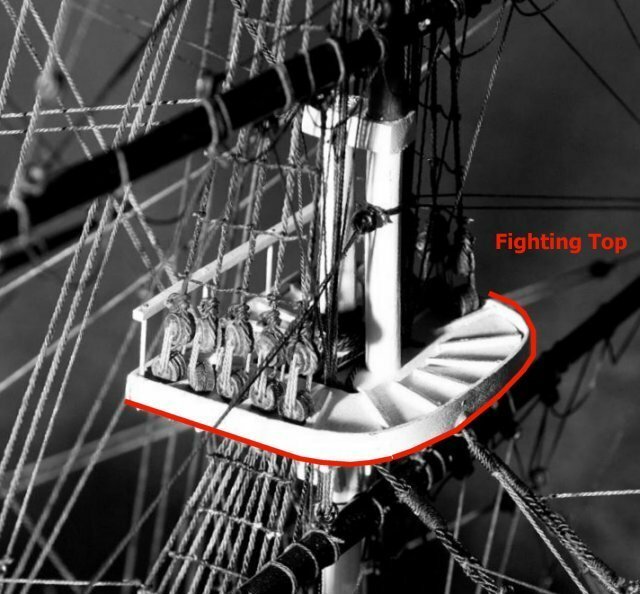 The fighting top was a strong wooden crow's nest position high on a warship's mast. 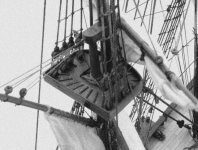 In the Old Corps during the age of sail sharp-shooting Marines climbed the masts and riggings and battled enemy crews from the fighting tops. The Marine sharpshooters in the fighting tops of America's legendary frigates, took on the British navy during the American revolution. On 10 March 1783 Marines in fighting tops of the USS Alliance helped defeat HMS Sibyll. The great frigate duels of the War of 1812 might have ended differently if it were not for the Marine sharp-shooters and grenadiers in the fighting tops of such as Old Ironsides. The Battle of Trafalgar was fought on 21 October 1805 off Cape Trafalgar on the Spanish coast, between the combined fleets of Spain and France and the Royal Navy. It was the last great sea action of the period. 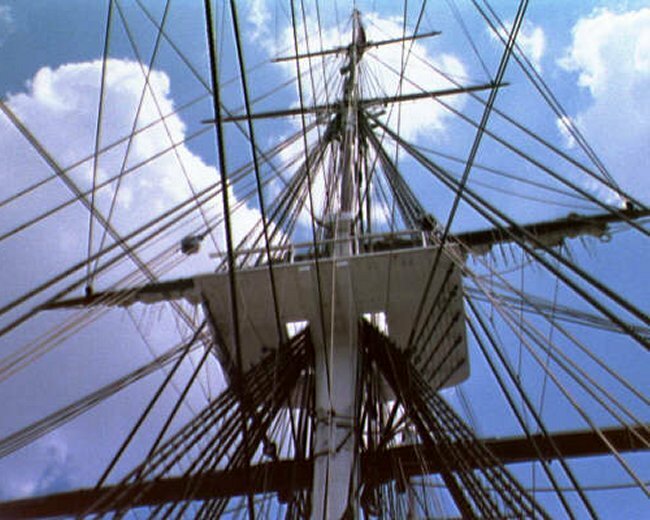 During the battle, HMS Victory ran on board the Redoubtable, just as her tiller ropes were shot away. The French ship received her with a broadside; then let down her lower-deck ports, for fear of being bearded through them, and never afterwards fired a great gun during the action. Her tops, like those of all the enemy's ships, were filled with riflemen. Nelson never placed musketry in his tops; he had a strong dislike to the practice; not merely because it endangered setting fire to the sails, but also because it is a murderous sort of warfare, by which individuals may suffer, and a commander now and then be picked off; but which he believed never can decide the fate of a general engagement. 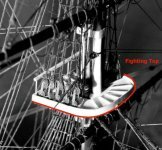 Admiral Nelson was killed, receiving a fatal wound from a musket ball fired by a French sharpshooter in Redoubtable's mizzen fighting top. Marines did not use rifles in the Revolution and did not become known as expert rifle marksmen until many years later. Close range combat of the day did not require the longer range and precision (nor justify the cost) of the rifle. A trained man could get off only two to three shots a minute with the cheaper smoothbore; but the more expensive rifle took even longer to load. The musket's range of one hundred yards or less made it effective against massed formations in land combat. For seagoing Marines, in the fighting tops or in boarding parties, the action was at fifty yards or less. At that distance, a trained man could be expected to hit a man-sized target. The seven-barrel topman's musket, built first by a London gunsmith named Nock, gave Marines another competitive edge in close ship-to-ship combat. 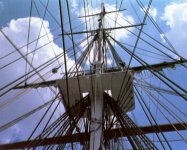 A Nock flintlock fired all seven barrels at once and the effect against an enemy's fighting top, officers and helmsman on the quarterdeck, or a gun crew was devastating. The recoil against the Marine firing the Nock was less deadly-but nevertheless painful. Towards the end of the 19th Century the military tops of warships resumed the circular form. USS Olympia (Cruiser # 6, C-6, later CA-15, CL-15, and IX-40), a 5586-ton protected cruiser built at San Francisco, California, was commissioned in February 1895. The cruiser was born out of a program of ships for the "New Navy" of the 1880s and 1890s designed to correct the deficiencies of a weakened and neglected naval force. Known at the time as a Protected Cruiser, she was fast, carried a good armament, with moderate protection. The ship has a double barrel eight inch gun turret on the front of the ship and a double barrel eight inch gun turret on the rear of the ship. Ten (10) Five Inch (127 mm) naval guns are mounted in Casemates; five are mounted on either side of the ship. The guns have a limited arc of fire due to the fact that they were mounted in casemates and cannot be used against air targets. The 1902 overhaul gave her a new rig, removed the torpedo tubes and fighting tops, relocated the hawsepipes, substituted ornate scrollwork and a figurehead for the bow shield, and replaced her 8" turrets with deck guns.